We’re fast approaching the time when we need to use up or preserve the last of the summer produce in the garden. Or for those without a kitchen garden, the last of the good value summer fruit and veges in the greengrocers. The glorious thing about the changing seasons is almost all of the food we eat has a season, whether it is fish or fowl, fruit or vegetable. This is a time when it is abundant and at its best. During the centuries understanding the seasonality of our food was vital for survival and became ingrained in the cultures of the peoples around the world. Today, we have all but lost this accumulated wisdom in an age where technological advances and the global market place can bring us anything we want to eat, whenever we want it. So here’s my challenge to you: let’s eat local and in season. As the amazing growth in farmers’ markets shows, and the resurgence of the classic greengrocer, more and more people are seeing the benefit of local seasonal food. The obvious benefit of being fresher, tastier and more nutritious is just the start. The unseen advantage is in-season food requires less energy – and associated CO2 emissions – to grow and transport, it supports the local economy. And best of all, it’s cheaper. This dish is a wonderful celebration of flavour and colour, but while the capsicums and tomatoes are still cheap make much more than you need for just one meal. Because what’s left is gorgeous eaten cold or if you liquidise them, without the stalks, you’ve just made your own pasta or pizza sauce to pop in the freezer for a later date. Think of those dark winter’s nights when you’re late home from work and can’t decide what to eat. Now you can retaste summer with a healthy pasta meal made in minutes.So easy and so colourful. 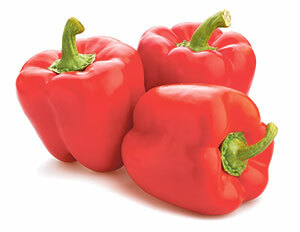 Cut peppers in half and remove seeds, leaving stalks intact. Lay peppers on an oiled roasting tray and put the quartered tomatoes in them. Sprinkle with chopped anchovies and sliced garlic. Drizzle olive oil over each pepper and season with black pepper. Place on a high shelf in a pre-heated oven at 180 degrees Celsius for 50 minutes. Garnish with basil and serve.